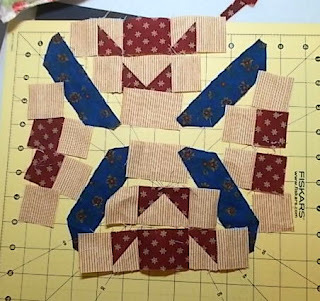 Today I will discuss how I made the Flower Garden Path block for the Farmer's Granddaughter Quilt Along. 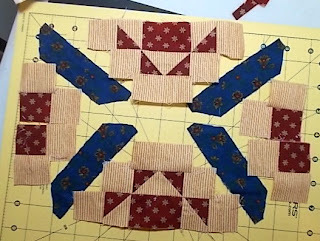 I had big problems the first time I tried to make the block because I did not discover that template #44 is the wrong size until I was almost finished constructing the block. Yes, I was shocked, too, but it turns out that this problem can be corrected. Background fabric: four pieces cut from template #20 and 20 pieces cut from template #13. Medium fabric: eight pieces cut from template #13, four pieces cut from template #19, and two pieces cut from #25. Dark fabric: two pieces cut from the new template #44, which will be described later in this post. I was quite proud of myself when I cut my new template out. It would take some time, but I was sure you all could draw all the triangles necessary to make the new #44 template. However (and this is actually a good however), then I compared my new template with the template from the book. 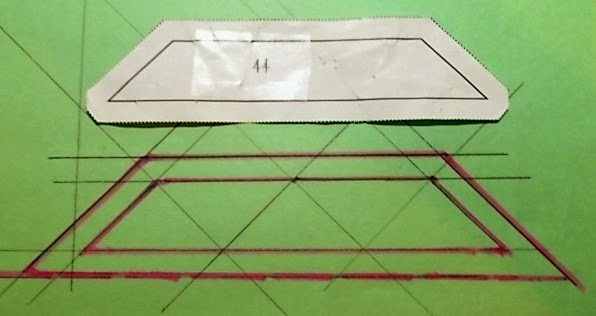 I put the template from the book on top of the new template I had so proudly drawn and discovered that template #44 from the book fit perfectly within the seam allowances of my template #44. All of a sudden the directions for drawing the new template became much, much simpler. 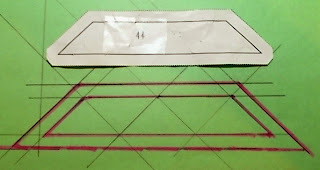 In order to make the new template #44, simply put the template #44 from the book on a piece of paper and carefully trace its outline with a pencil. Then draw a 1/4" seam allowance around the outline. Cut out your new template #44 by cutting the paper just inside the pencil line you drew for the seam allowance. In other words, template #44 from the book is just missing the 1/4" seam allowances. All my careful draftsmanship (draftswomanship?) was unnecessary. 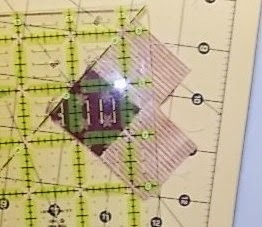 I actually did not need to tell you about my adventure in drawing the template, but I was so proud of myself (before I figured out the easy way). And I had taken photos. 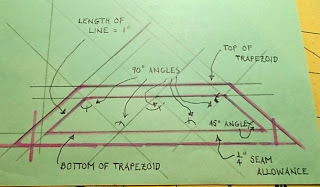 But, just a little tracing and drawing of seam allowances will give you the template instead. Here are some of my background and medium pieces for the Flower Garden Path block. 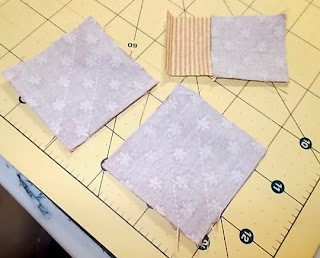 The two bigger striped-fabric square (on the right) have been pressed on the diagonal. Just below them and to the right four squares I cut from the medium fabric from template #19 are also ironed on the diagonal. I put the larger (2" x 2") background squares on top of the larger (2" x 2") medium squares and sewed 1/4" on each side of the pressed diagonal as shown below. The background rectangle from template #25 with the medium square from template #19 in the upper right of the above photo shows how I sewed along the pressed line to make a folded triangle on one side of the rectangle. After I pressed the triangle over, I repeated the process on the other side of the background rectangle. 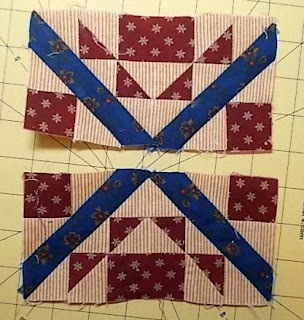 If you are an accurate enough quilter to use the templates, you should sew four background triangles from template #13 to four medium triangles from template #13; then press the squares open. 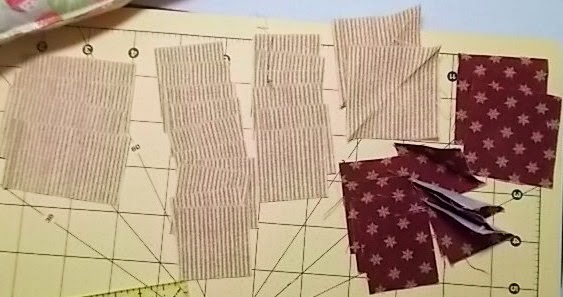 Also, sew a medium triangle from template #13 to each short leg of a background triangle from template #20; then press to form the rectangle and repeat again. Now your layout should look like this if you followed my HST and folding triangles method. If you used the templates, each one of the sixteen background squares in the photo above will be a background triangle cut from template #13. My plan, however, was to sew the rows together and cut the squares into triangles just before I sewed then to the dark (blue above) pieces. Here is what my layout looked like after I had sewn the rows together. Remember if you used the templates, you will have background triangles on the end of each row, not background squares. 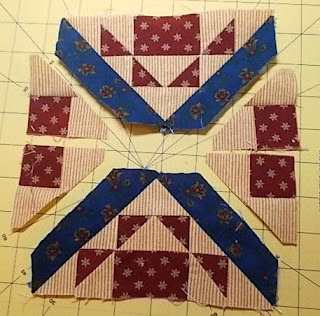 When I sewed the pieces of my top and bottom sections together, I pressed the seams on the five-piece rows (or, seven-piece rows, if you were good and used the templates) toward the dark sides. When I pressed the seams of the now three-piece rows (or, five-piece rows, for the template users), I pressed toward the light sides. This enabled me to nest the seams when I sewed the rows together. When I sewed the pieces of my left-hand and right-hand sides together, I pressed the first seam to the dark side. Then I pressed the second seam to the light side because it was much easier to press in that direction. I pressed the "horizontal" seams in the bigger sections open. This helped my sections lie flatter. But, please remember, you do not have to follow my pressing direction suggestions if you like pressing in different directions better. 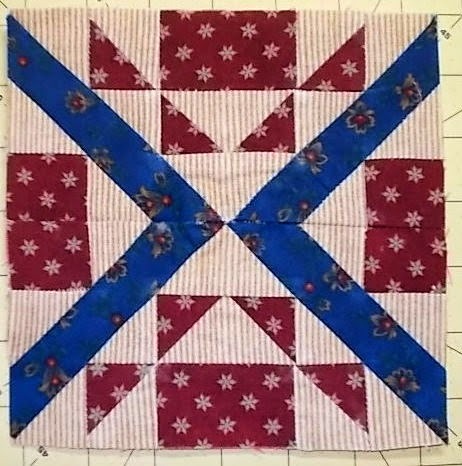 When the sections were completed, I used my 6-1/2" x 6-1/2" square to add a seam allowance to the triangles and finally made my layout look like the one the template users would already have. 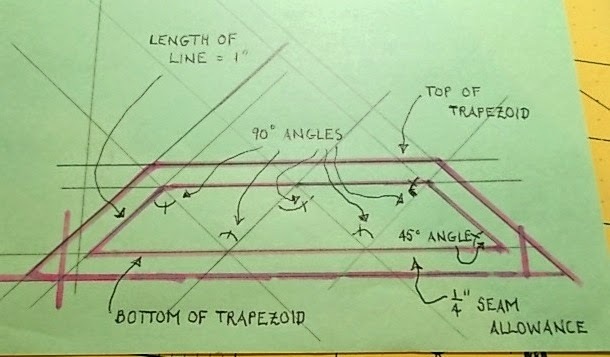 If you cut the triangles from squares as I did, you want to have the 1/4" lines on the top corner of the upper background square, on the right-hand corner of the medium square, and on the lower corner of the lower triangle. You will have to cut the edges with all background pieces to end up with a layout like this. If you used the templates all along, your layout should have looked like the one in the photo above right after you sewed the sections together. 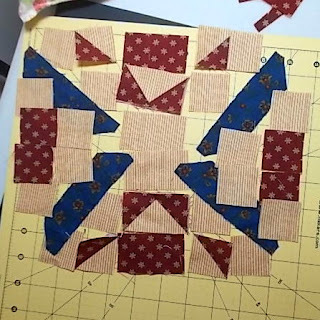 You then sew the longer base of each dark trapezoid piece to the short legs of the triangle composed of three rows of pieces. 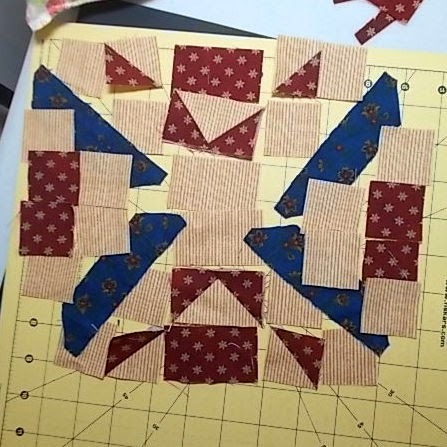 Then sew the hypotenuse of each two-row triangle to the shorter base of the dark trapezoid pieces. The result should look like what's in the photo below. Then sew the two rectangles together being careful to match the squares and trapezoids together. This last seam I pressed open because it was easier with all the intersecting seams. Finally, I ended up with my Flower Garden Path block. I had trouble getting one of my triangles to lie flat, but more pressing helped. You will probably not have that problem because you have to be a more accurate piecer than I am. The Flower Garden Path block has a lot of pieces, but it goes together quickly. If you use the correct template #44, you shouldn't have any problems. If you do, please leave a comment in the Forum post I will create for this block. Do you all miss Meli by now? Well, brace yourselves. I will be back with W19B1 (the Flower Pot block) soon. I promise to try making it with the templates first. If I have too much trouble, I may use Musical Starling's paper piecing method. Do not let the inset seams frighten you. I have had a class on hexagons, so, in theory, I should be able to explain them.